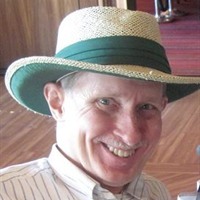 My being in a wheelchair ever since I had polio when I was six years old in 1955 didn't mean I was housebound. I still got to spend summers on Cape Cod with my two sisters and 6 cousins. We'd all go to the salt water and fresh water beaches nearly every day. Occasionally we'd get to go to other parts of the Cape. One of the most interesting locations was the White Cedar Swamp up in Welfleet. It was unlike any other part of Cape Cod. The start of the trail was at the Marconi Station Site, where the first wireless radio transmissions were made from America to Europe. Even though I was in a manual wheelchair, that didn't prevent my cousins from pushing me down the path from the parking lot, through a wooded area, to the swamp itself. That part of the trail was hard packed dirt, but it had a few steps to go down, which is which is why we didn't return that way. When we got to swamp it became much smoother thanks to the boardwalk. It was sunny day when we were there and the sunlight shafted through the cedars and sparkled on the clear waters of the swamp. The green foliage provided a cool canopy over and around us. It was like another world that you would read about in storybooks. And the boardwalk provided a marvelous pathway for my cousins to push me on at high speed, or for me to wheel myself at more leisurely pace. In due time we got to other end of the swamp, where the boardwalk ended. One of my cousins was pushing me at the time and as we left the boardwalk we slowed down a bit. Well, actually we slowed down to a snail's pace. You see, the path that led back to the parking lot wasn't hard packed dirt. It was sand. My cousin had a quite a determined nature and wasn't going to let a little sand stop us. He pushed. He shoved. He turned my chair around and pulled. Little by little we moved along an inch at a time. But the sand got deeper and we sank further into it. Thankfully, the other cousins and our Moms showed up. They helped. Somebody got the brilliant idea to move toward the edge of the trail and into the grove of scrub pines. The sand there was not quite so soft and we managed to make slow but sure progress back to the car. It was quite a day. 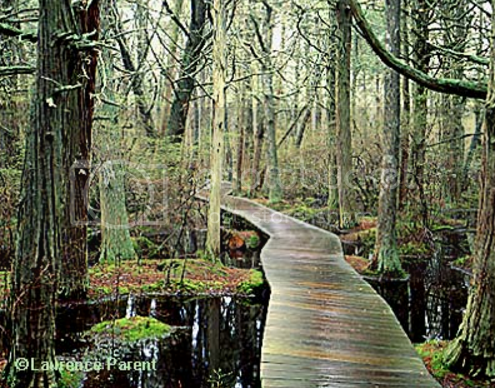 If you're ever down in Wellfleet you might enjoy a visit to the White Cedar Swamp. But if you are in a wheelchair, I don't recommend you do it on your own. If it hadn't been for my cousins, I might still be there.